Republican congressional candidate Mark Donka deleted a link to an offensive blog post over the weekend after Vermont Republican Party chairman David Sunderland called the episode "disappointing." 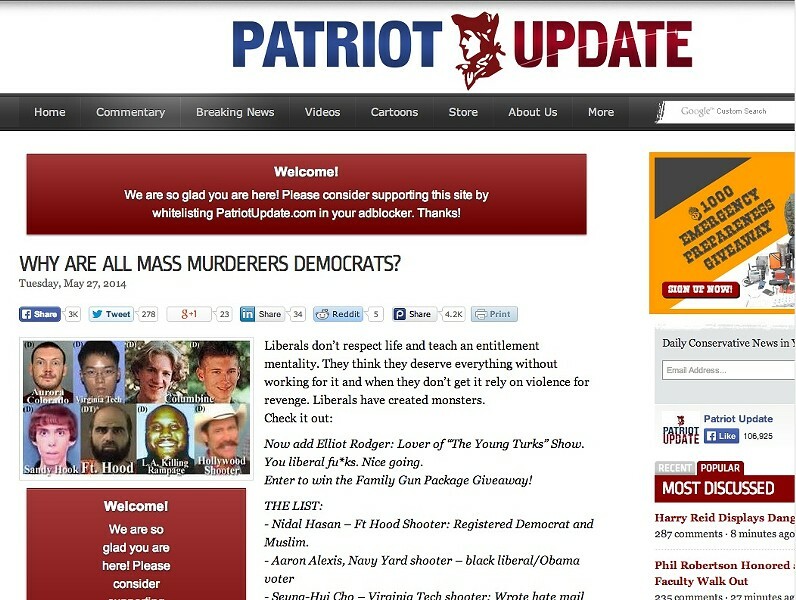 Last Tuesday, the party's 2012 nominee linked to a post on the website Patriot Update with the title, "Why are all mass murderers Democrats?" Originally published on a site belonging to conservative activist Samuel Wurzelbacher — better known as "Joe the Plumber" from a brief star turn in the 2008 presidential campaign — the piece listed several alleged mass shooters and claimed they were registered Democrats. "Now add Elliot Rodger: Lover of 'The Young Turks' Show," the blog post reads, referring to the alleged perpetrator of a recent mass shooting in Santa Barbara. "You liberal Fu*ks. Nice going." While Donka himself did not write those words, he stood by his decision to link to them in an interview Friday afternoon. "Do I think it's appropriate as far as me saying something on my personal website? Sure, I can say what I want," Donka said. "Like I said, a lot of it was true." Asked which portions of the blog post were true, Donka said, "That probably some of the people were Democrats? Yes, I'm sure some of the people were Democrats. I'm not going to say they were 100 percent Democrat." Donka would not say Friday whether he planned to keep the item on his Facebook page, saying, "I'll have to look at it again." Later that day, after Seven Days asked Sunderland whether the party stood behind Donka's remarks, the party chairman called the candidate and "suggested that that posting be taken down," Sunderland said. "I think it's disappointing that Mr. Donka has chosen to, I guess, associate himself with that type of language and tone of language," Sunderland said. "I think there's no place in Vermont politics for the kind of rhetoric that is displayed in that piece. I think it distracts from the issues that are important to Vermonters." Over the weekend, the link to the post was removed. Donka, a Hartford resident and Woodstock police officer, lost to the incumbent Democrat, four-term Congressman Peter Welch, getting 23 percent of the vote to Welch's 72 percent in 2012. He's now seeking a rematch, but could face a Republican primary. A spokesman for Welch said he had no comment on the matter. 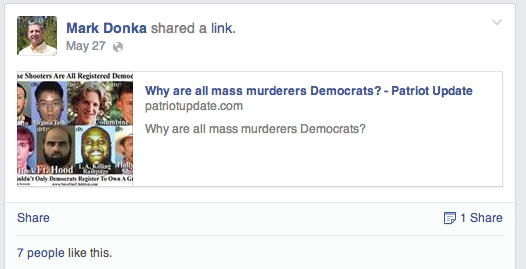 Donka's link initially drew seven "likes" and a handful of comments from his Facebook friends, including one from a user who wrote, "Democrats excel at Evil." Another commenter, Vermont Citizens Defense League founder Eddie Garcia, appeared to cast doubt on the original post, linking to another website that debunked its assertions. Because he was simply linking to a blog post authored by another person, Donka argued, he was not responsible for its content. "We looked into it a lot and— it was somewhat true, but somebody had actually put it out there a little bit embellished. Which happens when you post things," he explained. Asked whether he thought liberals really were more prone to violence, Donka said, "No, I think liberals are just more likely to be anti-gun."